Come sta procedendo la vostra settimana? Il look che vi mostro oggi è un total black, spezzato solo da questa t-shirt con accenni al grigio e qualche paillettes qua e là. Di solito i pantaloni/jeans che prediligo sono skinny, ma questi in seta di Banjo&Matilda sono talmente morbidi e comodi che mi hanno fatto cambiare idea; ad essi ho poi abbinato blazer, pumps e pochette tutto in un rigoroso nero! Aspetto i vostri pareri ed intanto vi auguro uno splendido pomeriggio! How is going your week? The look that I show you today is a total black, broken only by this t-shirt with hints of gray and a few sequins here and there. Usually I wear skinny pants/jeans, but these ones in silk by Banjo&Matilda are so soft and comfortable that I have changed my mind, I then matched them with blazers, pumps and pochette all in a strict black! I'm waiting for your opinions and in the meantime I wish you a wonderful afternoon! Bellissime le scarpe, adoro i tacchi così alti!! sono comode? like the look esp the blazer n the tee!!!! casual chic!!! great styling! really love your silk pants! I am really crushing on your pants. I would love a similar pair! I love your tshirt and those pants are pretty great! Such a gorgeous outfit. Especially the shirt! Where is it from? What a great look! Love the shirt and the shoes are amazing! mi piace molto!davvero belli i pantaloni, poi con l'aggiunta della giacca mi piace ancora di più, da tutto un altro stile all'outfit! I love your outfit, so black <3 Your hair is awesome by the way. Complimeti per il tuo blog..ma anche per il post! Ti seguo volentieri! 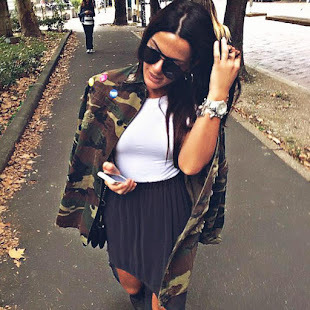 Vienimi a trovare pure sul mio blog ho proposto un outfit e vorrei sapere cosa ne pensi! love the simple clean look :) the pants look really comfy! your pants are so amazing, love them! Nice pictures, you look gorgeous. Maybe you want to follow each other? Thanks a lot for your compliment on my blog and for giving me the chance to discover yours, which is very enjoyable and inspiring! I absolutely value fashion sense and attitude, and you sure have both, girl! Keep growing that style passion! BTW, I've so fallen for this ensemble: each piece is gorgeous, but even better it's the way you carry it all off. Of course, I'm following you now, and if you like my blog, I'll be thrilled to have you among my followers via GFC, too! You have a great style.. love epseically this outfit! Thank you so much for your comment on your blog! I am now a new follower, I love your outfit! How cute is your top!! Amazing outfit you look so CHIC.